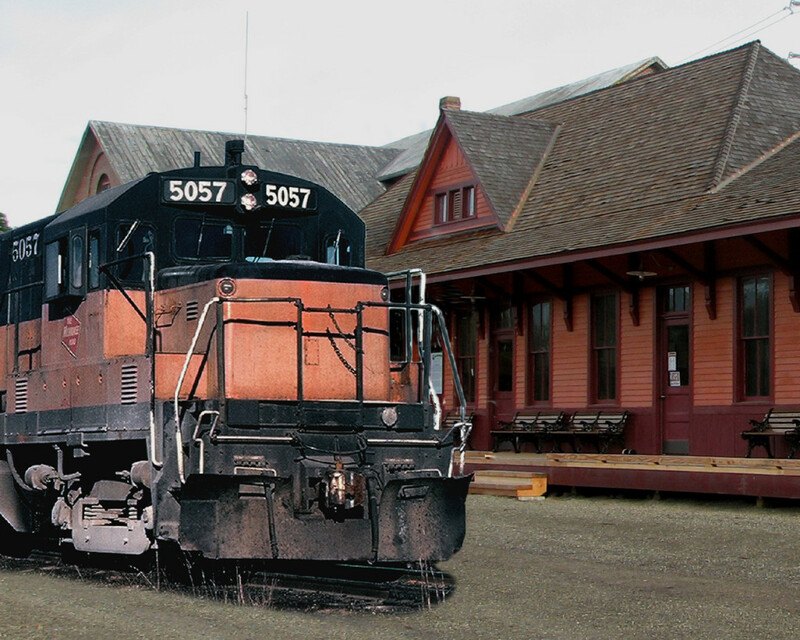 Photo montage of the 5057 and the Cle Elum depot by Tom Kermen. Cascade Rail Foundation is working to bring Milwaukee Road 5057 (a General Electric U25B diesel locomotive) from the Western Pacific Railroad Museum in Portola, CA to the South Cle Elum Rail Yard Interpretive Center for display. Having a Milwaukee Road locomotive at South Cle Elum is important step in the development of the rail yard as an interpretive center. The 5057 has strong ties to Washington and is well-suited to telling the story of the railroad here. Currently, no Milwaukee Road locomotives are on display in Washington. We are raising money to purchase the locomotive, prepare it for display, and move it to the Interpretive Center. To follow our progress you can sign up for our email list, follow us on Facebook, read our project blog, or check here for the latest news. The 5057 was featured in a Charlie’s Trackside Postcards episode on Model Railroader Video Plus (MRVP) subscription video website. 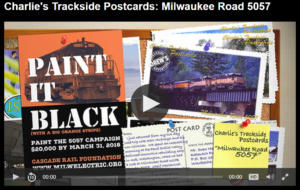 While these shows are normally accessible exclusively to MRVP subscribers, Kalmbach has generously agreed to make these episodes available to the public free-of- charge to support the 5057 repainting drive and the work of the Cascade Rail Foundation. Thank you, MR Video Plus! September 2018 The 5057 was mentioned in the 2018 issue of Locomotive magazine. Learn more in the News section. August 2018 We have raised the funds to complete the cosmetic restoration. Now we are planning the move to South Cle Elum so we can set our next fundraising goal. Read the News for more details. November 2017 We are raising funds to paint the 5057 next spring. Read more on the 5057 blog. August 2016 Work has begun to cosmetically restore the 5057! Read more on the 5057 blog. November 2015 We visited the 5057 at the Pend Oreille Valley Railroad shop in Usk, WA last month and talked to the people there about the restoration plan. Read more on the 5057 blog. July 2015 The 5057 is fifty years old! It was delivered to the Milwaukee Road on July 14, 1965. Happy birthday, 5057! Read more on the 5057 blog. December 2014 The 5057 is back in Washington for the first time in nearly 35 years! It arrived at the Pend Oreille Valley Railroad shop in Usk, WA on December 15. We are working with them to plan the cosmetic restoration. November 2014 The 5057 is about to come ‘home’ to Washington! The restoration phase of the project is next. Read the News for more information.